Life is sweet. A little sweat makes it interesting. Super easy. Super quick. Let’s do this. I make alot of rice so I can pile it on the sides and MAYBE have leftovers. 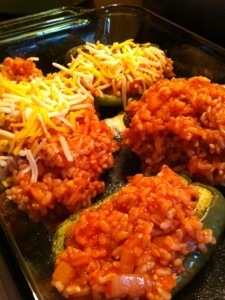 Grab your green peppers and slice them down the middle. Scrape and wash them up. 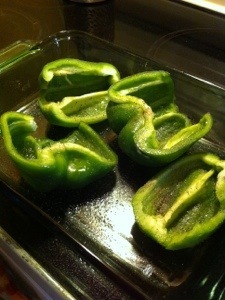 Then brush with olive oil and sprinkle salt and pepper onto them. Put in a 375 degree oven until they are soft. While those are baking, sautee red pepper, onion, and garlic in olive oil. Season to liking. 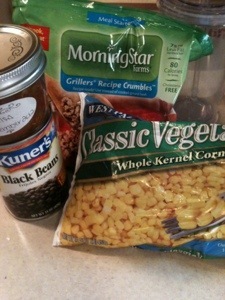 I like to add veggie broth to help them cook and for flavor. 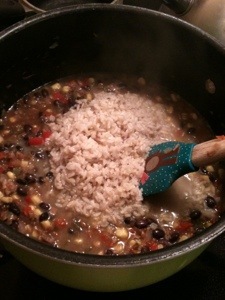 Once cooked and soft add rice and sauce. 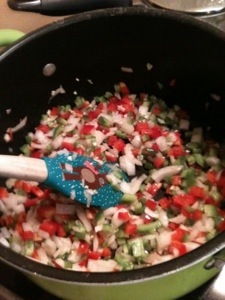 Take your peppers out and fill them up with your mixture. Tyrell has cheese on his. I just sprinkled some parmesan on my side. 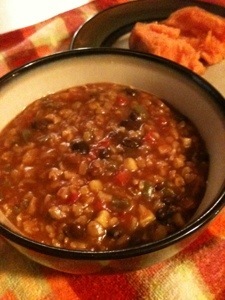 Have a big bowl of greena with this meal and you are good to go. One of my faves! Enjoy! 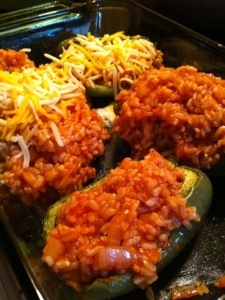 Made this last night for supper and I thought I would share my recipe real quick. 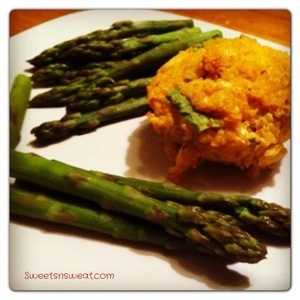 This was so easy to make and so delicious and fun to eat! While quinoa is cooking, mix up the remaining ingredients. It’s not too hard to cook these little guys. Just add water to cover your seeds and boil. Once they look like they “blew up”, they’re done. Super easy. Don’t you love my scientific instructions? Add the quionoa to the mixture and mix. Place into cupcake tins. I filled my cup up to the top and then pressed the food down. Bake for 15/20 minutes. Take out when golden brown on top. Enjoy! I’ve been craving hot chocolate baaaad lately. Those cheap little packets do the trick, but have you ever looked at the ingredients? I wanted to make my own hot chocolate. 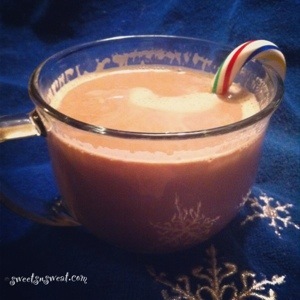 I remember making it as a kid using milk and chocolate syrup. Gross! I would just pop that mug in the microwave and then chug my warm chocolate milk. Good times. Now that I’m all old, wise, and I can’t digest milk….I figured it’s time for a new recipe. -Add 3 cups of almond milk (I used vanilla almond milk) to a small saucepan. -Heat through. If you want more cocoa, then add it. And so on and so on. Turned out so very yummy. The almond milk gives it a nutty flavor. Love that! Another healthy alternative in the books! I hope you like it just as much as I did! I had a ton of almonds staring at me in our pantry, so I thought I should try something new. 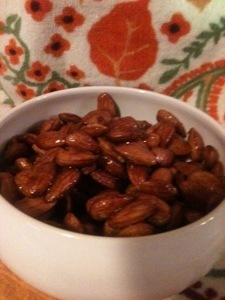 Roasted almonds with honey and cayenne pepper. •Line baking sheet with parchment paper. 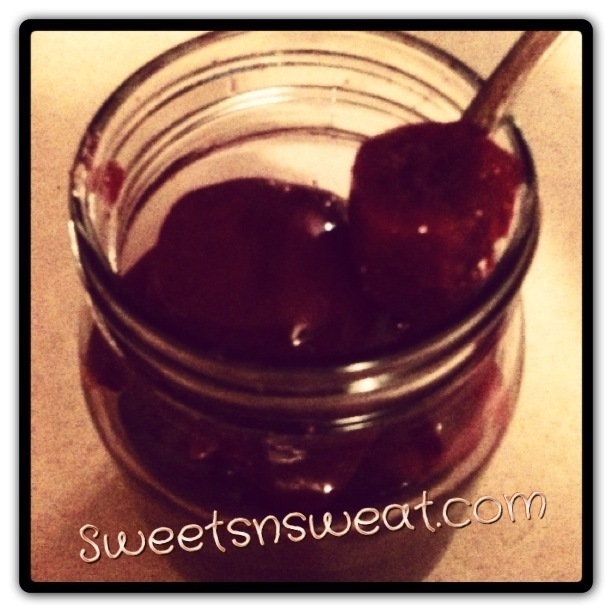 •Melt honey in a pot over medium heat. •Add cayenne and almonds and stir until coated. 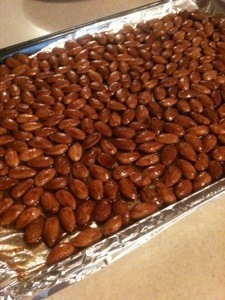 •Spread almonds onto baking sheet. •Let cool then toss with salt. 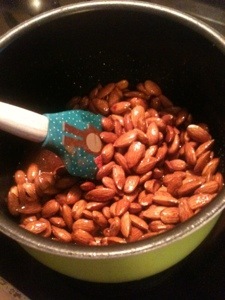 •Spread almonds again on a clean baking sheet. •Cool completely. Devour them and eat your calories in almonds like I did. This is by far THE best chili I have ever made. I used ingredients that I had in my kitchen. No trip to the grocery store required, which makes it even better. I decided to cook up some rice while I was chopping my green and red pepper, onion, and garlic. 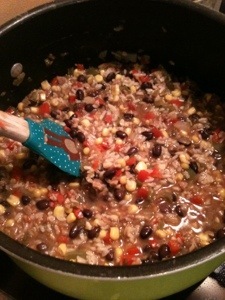 I use long grain brown rice. Saute veggies with crumbles. Do you like my reindeer spatula? Jealous? Once the veggies are just about cooked, add a cup or two of broth. I didn’t measure anything. Just eyeball it. You want to cover the veggies so they cook all the way through. 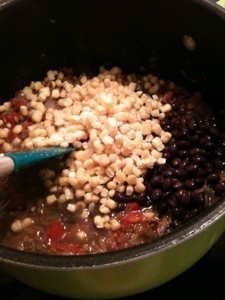 Once they are cooked add the beans, tomato soup, corn, and salsa. Don’t forget about the rice! Spice it up to your liking. I let mine simmer for two hours. I also threw a sweet potato in the oven. Love this combo! Thank God for leftovers. Enjoy! Veggies and a hot bath. So bummed that it’s Sunday and we have to go back to work tomorrow. Boo for work. So, did you stuff yourself like crazy this Thanksgiving? I did! This was my first big holiday as a vegetarian. Not a big deal for me. I just ate a ton of other food! I started the day off with a 5K run. My hip has been bugging me lately so it was a slower run. I had to stop and walk a few times. I felt clumsy so I knew I wasn’t running “right”. Something must be out of whack. We made caprese skewers to bring over to my grandparents for Thanksgiving. Every skewer I made I ate a tomato. They were so good! I bought them the Sunday before Thanksgiving and I worried they would be all wrinkly by then. I read somewhere that you shouldn’t put them in the fridge, so I thought I would try it. I never have any room in my fridge anyway. Let me say, this tip is right on! Stop putting your tomatoes in the fridge people! We put balsamic vinegar in the middle of our skewers. So good! All you need is some fresh basil, fresh mozzarella, and some cherry tomatoes. Oh my heavens. My cousin Lee Ann and I scarfed these down. I think some other people might have had a chance at some too…if they were lucky. So I ate a thousand tomatoes, four hundred cucumbers, 80 carrots, and 28 black olives. I got my veggie fill in! I also pigged out on Lee Ann’s pumpkin pie chex mix. I should have taken a picture, so good and addicting. When the actual dinner started I just grabbed a tablespoon of mashed potatoes (I don’t like them. I just felt I should have some), some corn, coleslaw….and I ate half of my mom’s veggie tree. It was a good day! Now that we got all of that Thanksgiving business out of the way…Christmas decorations have been put up! I put out a lot more this year. Maddox is getting older and HOPEFULLY he’ll be careful. So far so good! Here’s our pretty tree. Today I was scheduled to do my last workout for month 2 with Les Mills. Well, I woke up, sat up, and twisted wrong. Now it feels like there’s a monster under my shoulder blade eating away. I could barely get my contacts in. Tyrell rubbed it for a while and I made him stop because I was going to cry like a baby. So, I spent some time on the foam roller. Seemed to help a little bit. Tyrell suggested I go take a bath. 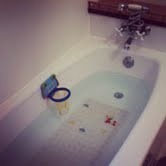 I thought this would be the perfect time to try out that detox bath on Pinterest. I never take a bath. Too many toys to clear out and this just doesn’t seem like the peaceful haven it once was. I didn’t play basketball or anything. I took advantage of the quiet time and just did NOTHING. Life sure changes when you have kids! Your bathroom and bathtub that used to have all kinds of soaps, lotions, and candles around it no longer exists. Oh well, I wouldn’t change it for the world. Why did I wake up craving pickled beets today? I didn’t have them for breakfast, but I did incorporate them in my lunch and dinner. My mom gives me jars of her pickled beets thankfully, so I didn’t have to shop or do any work. I was already thinking last night that today was going to be a rest day. It was on the shedule, but I don’t take them if I don’t want or need to. I am glad I did. Lifting is getting more intense with Les Mills and I greatly appreciated the extra sleepy time. In fact. I am looking forward to doing it again very soon. I woke up , started my work computer, got ready, and had my shake for breakfast. Second breakfast (a couple hours later) was peanut butter oatmeal. Snack was greek yogurt. Then it was time for lunch. I had a giant baby green salad. Toppings: pecans, tomato, red onion, and avocado. I snacked on some popcorn with Maddox this afternoon and had a green apple. I am either always eating or washing dishes. Why am I telling you everything I ate today? I have no idea. Maybe you need snack or meal ideas. There. 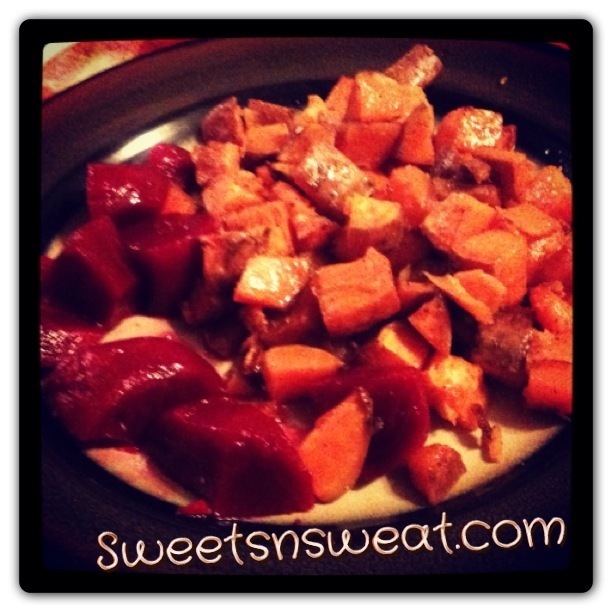 I wasn’t that hungry for supper, but I knew I wanted a sweet potato….and beets. Can you guess what I made? 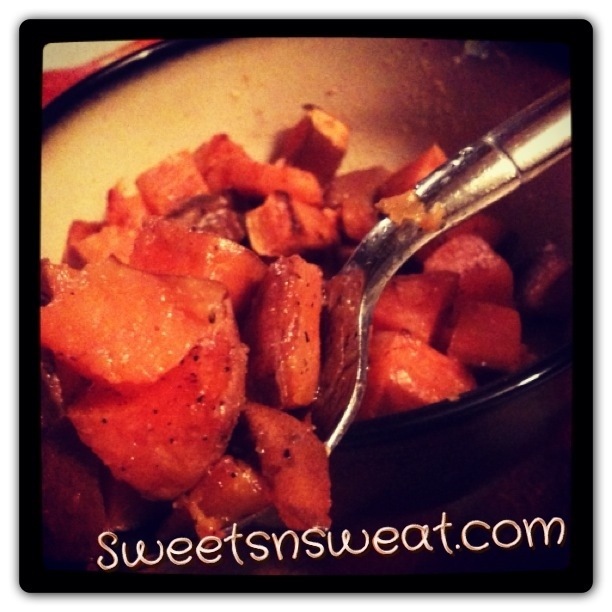 I chopped up a sweet potato and mixed a tablespoon of coconut oil, salt, and pepper with it. 400 degree oven for 40 minutes. House smelled super deliciously amazing. Doesn’t this look good? This would be a great side for any meal. Or, how about Thanksgiving? Oooo. So, I wasn’t too creative tonight, but this is what I wanted. It made a pretty plate. And it was so freaking good. The sweetness of the potato and the pickled beets mixed wonderfully. Another hit in my books. Oh yeah, did you see Engaged and Running’s post? A little Q&A with me. Go, read, and love it. My name is Lindsay. I am married to my best friend and we have an amazing, beautiful, and busy little boy. I love my family and I am very happy with my life. 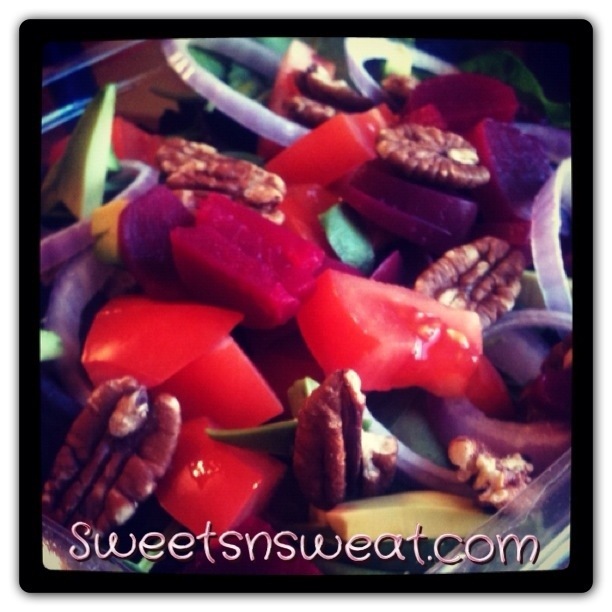 Sweets 'n' Sweat follows my life, my love for my family, and my passion for fitness and good food. Thank you for stopping by! Wine, Food, Adventure... Welcome to My Midlife.